I consider it a favorite album of mine, but the fact that half of Matt Wertz's 2006 Nettwerk release "Everything In Between" was replicated on his major-label effort "Under Summer Sun" less than two years later, plus the relative lack of appeal of any of the latter album's new tracks, gave me very little reason to buy it. So it's mostly understandable that his name wasn't high on my new release watch list another two years on. 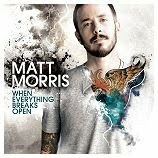 But, curiosity (and a couple of catchy song clips) got the better of me, and I decided to give his new album a try. Two listens in, however, I'm still only lukewarm to this album. The overriding theme is love and relationships (although, when you think about it, that can probably be said of the majority of albums out there), and the songs tend to sound similar more often than not -- though I don't know if one of those characteristics necessarily has to do with the other. "Nobody's You" is the first track off this set that I came to love, possibly because it's reminiscent of "Over You", my favorite cut from his '06 album. I've also started warming to "Running Back To You", with its broad, almost power-ballad feel, and the lilting bounce of "Someone Like You", but none of the other tracks have made an impression on me yet. Still, even though the ingredients seem the same, the snap, crackle and pop they created on "Everything In Between" is absent on this disc, or at the very least not as evident. 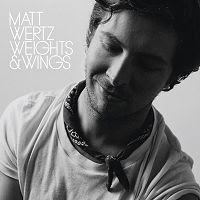 If you were looking for a continuation -- a "disc 2" of sorts, with b-sides and outtakes -- of that album, or just another excuse to hear Matt Wertz's charming and likeable vocals, this album will satisfy you nicely; it'd be great for something to play in the background and not necessarily call attention to itself. But if you're looking to have your ear truly grabbed, you may need to look elsewhere. A couple of years ago, I stopped actively seeking out new music -- hey, it's not like I don't have enough CDs already, plus I've always got a shopping list I'm trying to catch up on anyway -- and decided that, if I'm meant to discover an artist that I'll grow to love, their music will find me. Here's a perfect example: my brother was having trouble with his computer's speakers one day and asked for my help. After re-starting the machine and launching iTunes to test the speakers (he's not a digital music person, so I didn't expect to find anything at all in his iTunes library) I saw a couple of tracks by a group called The Posies. I double-clicked on one ... and not only did the speakers work, they showered me with a sound so delightful that I wasted little time in buying their two most recent albums, "Every Kind of Light" and "Blood/Candy". The majority of The Posies' longtime fans consider their earlier work to be superior, but this is my first exposure to the group, and I for one am loving their Rykodisc years. Most of the tracks on this set, particularly "The Glitter Prize" (featuring Letters To Cleo vocalist Kay Hanley) and "So Caroline", remind me of the glory days of so-called "jangle-pop" like the early-'90s work of bands such as the Gin Blossoms, R.E.M., and a particular favorite of mine, The Connells. "Accidental Architecture" smacks (in the best possible way) of '60s psychedelia, and "Notion 99" seems to borrow a bit from British Invasion pop. 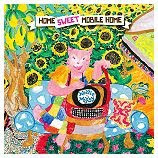 Other standout tracks include the engaging "Take Care Of Yourself" and the vaguely Flaming Lips-ish "Holiday Hours". There's very little filler here, if any at all. My discovery of The Posies can only be described as fate: I found out soon after that Microsoft pre-loaded Windows Vista machines with two tracks off the band's 2005 album, "Every Kind of Light" (which is a pretty decent album too, by the way). With music seemingly coming at us from all directions -- numerous other blogs, radio, TV, and in the case of most of us bloggers, emails from artists or their promotional teams -- it can very easily feel like we're drowning in a sea of sounds. Plus, if you're anything like me, the more music you hear, the more difficult it is to hear something that truly sets itself apart. 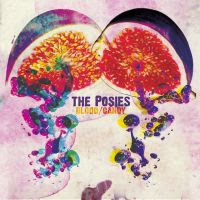 So, with sincere apologies to the bands whose promotional emails I ignore, I'm perfectly content with just stumbling upon music all by myself ... especially if the results continue to be artists as appealing as The Posies. Guess what? Tomorrow is the fourth anniversary of this blog! (Like, yay, and stuff!) Since I haven't gotten around to writing up my thoughts on any more of the new albums I've acquired lately, I thought it would be somehow appropriate to write an all-encompassing sort of entry befitting this blog's overarcing, music-without-borders theme ... besides, it's high time that I wrote about another book anyway. 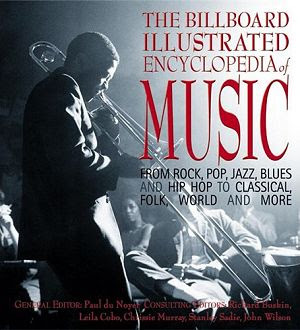 "THE BILLBOARD ILLUSTRATED ENCYCLOPEDIA OF MUSIC"
Not being much of an actual reader, I tend to gravitate more toward "coffee-table" kinds of picture books and the more concise, browse-worthy reference volumes; this title fits neatly into both categories. It's quite literally everything (basic) you always wanted to know about all varieties of music, organized sensibly and attractively, with sections covering all the general genres (rock, jazz, country, etc. ), each broken into chapters by subgenre (prog rock, jam bands, bebop, acid jazz, bluegrass, honky tonk, and countless others). Did you know there are almost a dozen types of reggae music alone? This book covers eleven of them! Each chapter of this work provies a brief history of the subject genre, lists key artists in each field, provides entertaining and enlightening quotes from music luminaries, and even prints a bar or two of music from a typical work in each subgenre to illustrate its composition. As if that weren't enough, the book includes a glossary of musical instruments, and even a primer on how to read sheet music. At only 448 pages, it can't possibly go into a whole lot of depth, but it does cover an impressive amount of territory. Since this book is strictly an encyclopedia and not a history of music, its coverage might seem a bit uneven -- dance music, which has been around for only a few decades, gets almost as many pages devoted to it as classical, which has existed for over three centuries. And then of course comes the categorization issue ... for someone like me, who knows how very blurred the lines between genres have become in recent years, the classifications of certain artists can seem somewhat arbitrary, if not downright inaccurate ... but that's a moot point to an extent, since specific artists aren't often mentioned except in short lists in the margins of each chapter, cited as rough examples of their respective genre. The odd melange of items under the "popular and novelty" section can be a little irksome (Shouldn't Contemporary Christian be a part of the Gospel section? Why isn't Easy Listening at the beginning of the Pop section? And what exactly defines "Nostalgia"? ), but that's a small complaint, given the wealth of information in the book as a whole. For anyone who's even a little curious about all the different kinds of music out there, or is otherwise unafraid to broaden their musical knowledge, this is a handy resource to have around and casually thumb through. Hey, music is a "continuum", after all. When you have to wait nine years for an artist to release their next album, especially if you loved their previous one as much as I loved Nick Carter's solo debut, "Now Or Never", it's nearly unavoidable that you'd raise your hopes and expectations to absurdly high levels. I got off on that album so much because it was such a departure from the squeaky-clean pop he'd been doing with the Backstreet Boys, and also because Nick's raspy, ballsy voice seemed tailor-made for good ol' guitars-and-drums rock. He was ready to burst out as the next Bryan Adams, and I could totally see it happening and was all set to follow him along for the ride ... but the album's sales fell flat and he put his solo career efforts on hold. Unfortunately, much like McFly's latest effort, shifting gears from rock to R&B has also removed most of what made Nick's previous album so distinctive and enjoyable. He's even tamed his voice back to the milder and more inoffensive timbre heard on his Backstreet Boys recordings. While there's certainly nothing wrong with that in itself, since pop-R&B is of course BSB's home turf and calls for a smoother voice than rock, it essentially makes this sound like nothing more than just another Backstreet Boys album -- only not as good, since it lacks the vocal synergy that A.J., Brian and Howie bring to the group. Has rock somehow gone out-of-style in recent years? The synths and beats of R&B have always seemed colder to me than the warm and organic sounds of guitars and drums. Lest you think I totally hate this album, I have to say it does have a few good moments, and it's already begun to grow on me a little. 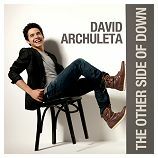 Several of the songs have fun grooves and good lyrics, particularly the energetic "Addicted", the power-ballad "Falling Down", the initial single "Just One Kiss", the fine ballad "Great Divide", and the title track. 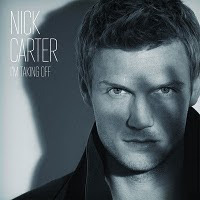 And then there's also the fact that it is, after all, Nick Carter's unmistakable voice which, though it lacks the grit and attitude of its rock persona, is still perfectly pleasant to listen to. If you still love Backstreet Boys, you'll love this album ... but if you're looking for more of the energy that made "Now Or Never" so special, you'll be disappointed. 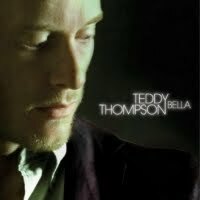 You know what I like about artists like Randall Bramblett and Teddy Thompson? It usually takes awhile for me to get to like their albums ... and yes, I mean that as a compliment. You see, with the attention spans of the American public whittling away more with every generation (and my patience for them seemingly eroding just as quickly), the music business appears to be preoccupied with grabbing the listener by the ears as quickly as possible with the catchiest nugget of ear candy that mathematical formulas and test audience feedback can cook up. That's not to say that Teddy Thompson's southern-tinged (you'd never know he's British by listening to him) folk-rock is never energetic. Indeed, the upbeat tunes may even outnumber the tranquil ones on his latest album. "The Next One" seems groomed for AOR radio play, and there's a jaunty syncopation to "The One I Can't Have" which, together with the equally lively opening track "Looking For a Girl", show that his wry humor is still in fine form. Jenni Muldaur lends her vocal talents to the duet "Tell Me What You Want", and the album's more subdued moments come in the fine ballads "Delilah" and "Over And Over", and the delicate acoustic number "Home". While I'll never outgrow the appeal of a fun pop tune that hits me over the head with its hook, I'll always appreciate the gentle and gradual pull of a singer-songwriter's subtle melody. Not only is it refreshing to hear an act that seems to want to take its own sweet time in turning on the listener (these kinds of artists are few and far between in my library, at least for now), but their "time-release" tunes serve to remind me not only that I've still got some patience, but also that patience is a virtue ... and can often be rewarded with songs that one grows to enjoy fondly. I can't remember the last time I had such mixed feelings about an album. When I first heard that McFly were taking a departure from their lovely and lively Beatles-esque pop sound and diving headlong into electro-pop/R&B territory, even recruiting the likes of Taio Cruz and Dallas Austin to help with songwriting and producing, I was puzzled and dismayed. Still being unclear as to why they've all but tossed aside the guitars and drum set (I can even picture poor Dougie and Harry standing in the background during a performance, not knowing what to do with themselves! ), I can't help but feel like they've sold out to the latest trend. That being said, however, they're still McFly, and that's the only reason I bothered to give the album a chance, figuring that whatever McFly do they'll probably do well. For the most part, I was right. Their songwriting is still pretty good, although we've seen better (I consider "Wonderland" to be their best in that regard), and of course their voices are as great as they've ever been. 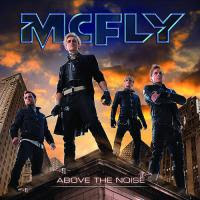 I actually find more to like on the second half of the album, like the cool neo-soul breeze of "This Song" and the bouncy old-school pop tune "I Need a Woman"; it doesn't help that McFly sound more like their old selves on these tracks. As it turns out, though, McFly can lay down a good dance-pop tune with the best of 'em -- just listen to "Party Girl" and the '80s-tinged "iF U C Kate" for evidence of that -- although it's still the fact that this is McFly we're talking about that keeps me from enjoying them more (well, that, and the fact that I've never been big on dance-pop to begin with). Call it a nit-pick if you must, but I have to wonder if it might have behooved them to adopt an alias for this project, kind-of like Garth Brooks billed himself as Chris Gaines for his brief foray into rock. As a pop album in general, it's pretty darn good (up there with some of the best post-millennium R&B-flavored boybands), but as a McFly album I'm afraid it's just "okay" at best. At Last ... My 2010 Countdown! I really didn't have my crap together last year, seeing as how I'm already more than a month late on posting my annual favorites countdown. It sure wasn't because of lack of devotion to music; I bought as much music last year as I do every year -- that is to say, adjusted for the slight "budget cut" I've been trying to make each year. I just was so preoccupied with building a particular part of my music collection (which I hope to share with y'all sometime soon) that I didn't pay as much attention to new music as I usually do -- and consequently, I didn't buy a whole lot of 2010 releases in 2010. As a result, this countdown isn't going to be what I, and probably some of you, would expect. For instance, I rather suspect that the latest Take That and McFly albums would have appeared on the list ... if I had gotten around to buying them in time (and no, shame on me, I still haven't). Other worthy but unfortunately absent contenders: The Posies, whose latest album is fantastic but whom I didn't discover until around New Year's Day; and Jamiroquai's fresh disc, "Rock Dust Light Star", which I added to my want list thanks to the clips I listened to just the other day. But all was not lost, as I was able to find enough titles to warrant a 15-item countdown ... though it did involve bending my own self-imposed rule of a one-year, December 2009 through November 2010, release date window. But everything on the list is something I didn't know about until 2010 (though it might have been released in 2009) and bought in 2010, so as far as I'm concerned, that's close enough. So, such as it is, and as seriously (or not) as you want to take it ... here's the list of My Top 15 Favorite CD Purchases of 2010!! The latest Norwegian "Idol" alumnus to draw me under his spell, he conjured up a dreamy batch of lush, '80s-inspired, electronica-tinged pop tunes for this stellar debut. Not perfectly up my alley, but close enough to make me a fan. He set aside the bluesy sound of his first album in favor of a more pop-rock vibe on his sophomore disc, but that's not at all a bad thing -- his soulful voice and his knack for a tune are in as fine form as ever. A "Weird Al" Yankovic for the more intellectual set (and also a big inspiration for Al), Lehrer has finally gotten the career-spanning compilation he's deserved for decades, complete with a bonus DVD ... a real treat! Sweden's 2008 "Idol" fourth-place finisher surprised me in a big way with a platter of ear candy that's jockeying for a place in my top five favorite albums ever from an "Idol" alum. His homeland must be proud! He's got a voice that, even on the muzak in a crowded, noisy restaurant, grabs my ear and is instantly recognizable. He sounds as wonderful as he ever has on this disc of classic country favorites. I'll admit this is the first album of her's that I've bought since her debut -- but only because her second was packaged cheaply, and because her third was a Doris Day tribute -- but she's still one of the best female artists around. The overtly political bite and broad sonic variety of her first album are mostly absent here, but her vibrant and airy voice, her gift for a good tune, and her sardonic wit (evidenced by the album title) have never been better. Listen to: "Beneath The Underdog". After owning and enjoying one of his discs for a few years, I finally collected the rest of this guy's back catalog last year and have grown to love his music in recent months. 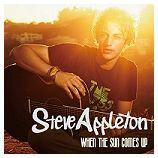 This latest disc is a change of pace for him, a subdued acoustic set in contrast to his dynamic and layered full-band albums. But it's no less enjoyable -- his keen songwriting, instrumental finesse, and achingly roughhewn voice give this album (and all his others) a beautiful texture that few other artists can match. Listen to: "The Grand Scheme Of Things". I'm rather surprised this album fell out of my top 5, as big a Hanson fan as I am. I'm not sure how to account for its low ranking. 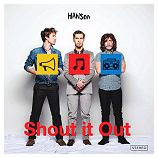 The horn accents and Motown influence give the album a fresh and upbeat sound and, this being Hanson and all, there's no shortage of deft songcraft and musicianship. Perhaps it's just because it was a bit short on the truly grab-your-ear-and-never-let-go hooks, coupled with the fact that last year's Tinted Windows side project made me not totally ready for the next Hanson album. Listen to: "Give a Little". I'm really starting to like the Rykodisc label. 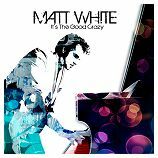 Aside from just generally putting out good music, they rescued Matt White from label-limbo after he was unceremoniously dropped by Geffen after one album (and a pretty darn good one, not that it matters). His first release won me over unexpectedly, so I was afraid I had my expectations too high for this one -- but I needn't have worried. This follow-up has the same unabashed charm as his debut, its stylings nimbly hopsotching between Paul Simon, Elton John and Jason Mraz. Listen to: "Colorblind". 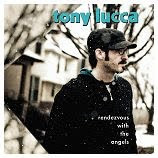 Since a Tony Lucca album I'd briefly owned several years ago never grew on me and I ended up trading it in, I had few expectations when I found this one in the $2.99 rack at Rhino Records and half-heartedly bought it. 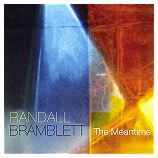 Much to my surprise, this talented folk-rock troubadour's latest disc has grown on me so much in the four months that followed, that even the songs that first made me cringe I now find myself tapping my toe to or humming along with. I guess that means I'm going to have to go buy "Shotgun" again...! Listen to: "Anchored". I hadn't realized how much I'd missed hearing new material from my favorite finalist from my first year of "American Idol" until his sophomore studio album arrived. I was just as happy to see that he mostly stuck to the same young-adult-pop sound that graced his first album, but with a perfectly natural bit of maturity added here and there. It was also nice to see him have the chance to stretch his songwriting wings. But the best part of all? Getting to hear that beautiful, soaring voice of his again. Listen to: "Parachutes And Airplanes". I've always had a soft spot for artists and albums that are a bit hard to define, a bit all-over-the-place. By that token, it would stand to reason that I'd find this one enjoyable. The listener hears some Jack Johnson here, a bit of Justin Timberlake there, and even dashes of Paul Simon and Randy Newman on other tracks. There's so much variety on this one, everybody's bound to like something. (Trivia note: this happens to be the second "Mickey Mouse Club" alum on this year's list, Tony Lucca being the other.) Listen to: "The Un-American". 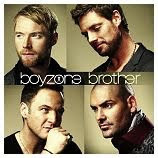 It was supposed to be their big, triumphant reunion album, but after Stephen Gately's sudden and untimely death in the midst of its recording, it took on the guise of a tribute. But aside from the poignant highlight of Gately's angelic vocals on a few tracks, as well as the beautiful tear-jerker of a eulogy, "One More Song", the album is their brightest and liveliest -- which, in a way, is entirely fitting -- and just might be their best yet. It's as if their friend's death gave their music a new infusion of life. Listen to: "Gave It All Away". I took a gamble (well, if you can call five bucks a "gamble") buying this unknown (to me) singer-songwriter, and I ended up winning big-time. Not only is the cover reminiscent of Ryan Cabrera, but he also has the same breezy, tuneful style ... just with a heaping tablespoon of funk and a teaspoon of hip-hop blended in. Each and every song makes me tap my toes, hum along, and like it a little bit more each and every time I hear it. His music is hard not to love, and just as hard to get out of your head. Listen to: "That's Life". 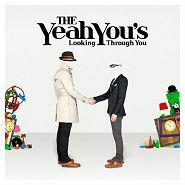 If you love The Feeling and have been waiting for their next album as much as I, then you'll love these guys too. Mike Kintish and Nick Ingram are a pair of Londoners who have crafted the most Supertramp-a-licious '80s-inspired electro-pop since Dan Gillespie-Sells and company. I came to love it so quickly that I had to stop myself from listening to this album too much too soon for fear of it losing its appeal. Word has it that they're no longer recording, at least not under this moniker ... a real pity, but at least the one album we did get from them was heaven. A special thanks to KulPop for bringing them to my attention. Listen to: "If I Could". I simply couldn't let my annual countdown go without mentioning this one. It's a box set -- make that an enormous box set, at 14 discs -- packed full of music from some 40 episodes of "Star Trek: TNG", much of which I'd been waiting to hear, uncluttered by dialogue and sound effects, for over 20 years. In every way, measurable and unmeasurable, it just wouldn't be fair -- either to itself or to the other releases -- to compare it to the rest of the titles in this countdown, so that's why it's in the "number zero" position, which leaves it mathematically ambiguous, so I'll let you decide whether it should be at the top or bottom of the list. Call it an "honorable mention" (I'm sure Worf would be proud). Well, I hope you enjoyed my Favorite Purchases of 2010 countdown, despite its tardiness. The new year is already looking up, with spankin' new Teddy Thompson and Nick Carter albums just days away, as well as an unexpected opportunity that I seized to obtain the three albums I mentioned at the beginning of this post, all of which are now on their way to me. Here's to 2011 being an active year for this blog, even though it's gotten off to a sluggish start. I've probably never mentioned vinyl records on this blog, except maybe occasionally in passing. It's not that I hate the format ... I've always had at least a handful of LPs in my music collection, and almost always have owned an apparatus on which to play them, and I don't even doubt the people who claim that they hear or feel a certain indescribable "warmth" and fullness to the sound of vinyl records that they say doesn't happen with any other format. The main reason I don't give much attention to vinyl, and almost never buy it, is purely circumstantial: its convenience, or (arguable) lack thereof. I'm a practical guy, you see, and the ubiquity of CD drives in most every computer, the instantaneous accessibility of any track on the disc with the touch of a button, and the ability to quickly rip a whole disc into a folder of neatly separated MP3 files that I can tote around on my iPod, are all factors that have made CDs my format of choice by a very wide margin. And then there's the relative fragility of records compared to CDs: they can easily get warped by heat, or get scratched and develop a skip ... at least more easily than their digital cousins. But there is now an outside chance that my neglect of vinyl records could soon change. You see, at a garage sale recently I happened upon a stack of about 30 LPs, all in excellent condition, and most from the early- to mid- '80s. It was a dandy little haul: multiple albums each by The Commodores, Lionel Richie, Eagles and Air Supply ... and even one each by Wham!, Phil Collins, and Peaches & Herb. I have yet to fire up my turntable and delve into them, but I'm somewhat anxious to. This one acquisition has more than doubled my library of vinyl LPs, and the other evening I actually sat down and organized my record collection for the very first time, only because I hadn't needed to before. These newly-acquired titles now intermingle with the handful that I already had -- some inherited from my parents, but the rest I'd bought myself over the years -- and all are now neatly alphabetized by artist and separated by genre. Will I become as avid a collector of vinyl records as I am of CDs? I don't quite see that happening. For one thing, I'm not nearly the audiophile that the majority of vinyl devotees are, and I'm happy with the sound quality of CDs and of MP3s of a decent bitrate (128Kbps and higher), which give me all the fidelity that my conscious ear discerns or requires. But I rather doubt that these will be the last records I ever buy. I probably wouldn't have bothered watching "The Sing-Off", since I've broken up with "American Idol" and didn't otherwise have the slightest inclination to get into "another singing show" (as my friend put it, with an exasperated "Agghhh!" in front, fearing I'd talk his ear off about this one too). But that all changed once I found out that the University of Oregon's totally awesome male a cappella group, On The Rocks, was slated as one of the ten competing groups. Besides, I've always liked a cappella music (though I can't quite say I'm an ardent fan), partly because it takes a lot more talent and artistry when you don't have any instruments backing you up ... not to mention group cohesion -- if just one singer is off, it can make the whole group sound sour. I was going to do a beat-by-beat review of the season premiere, like I've done with "Idol" in the past, but then I quickly changed my mind and settled on a more "free-form" approach for a couple of reasons, one of which is that only the judges unilaterally (or, since there are three of them, would that be "trilaterally"?) decide the eliminations all the way up to the final round -- not that my play-by-play of "Idol" was any less pointless, right? Don't get me wrong, I know they're all professional musicians and know their stuff, and the season has to move quickly (with just five episodes, all airing within a month), but what's wrong with at least some audience participation, like multiple-choice "clicker"-type gizmos that the studio audience can use to vote on their favorites? Speaking of the judges, I like them. I've tried and failed to become a fan of Ben Folds' music, but the guy himself is still likeable (and not just because he produced William Shatner's last album) and has a good sense of humor. Shawn Stockman of Boyz II Men is just as much fun to listen to, can also be pretty darn funny, and like Folds is a fount of musical know-how. Nicole Scherzinger ... well, she's kind-of the Paula Abdul of the group, although I feel guilty for selling her short like that ... she's not nearly as incoherent, for one thing, but she also doesn't get very deep with her critiques. And I love that their commentary is so much looser and wittier than that of the peanut gallery on "Idol". Nick Lachey, however, could take a lesson or two from Ryan Seacrest about relaxing a bit. The format of the show is a little puzzling, too, in how they seem to randomly divide the ten first-round groups into two halves and eliminate one from each half. It begs the question: What if the two worst groups were in one half, and one of the better ones was forced to be eliminated just because they were in the wrong half? I have to wonder not only why they don't evaluate all ten groups at once and hold both eliminations until the end of the two-hour show, but also what determined which groups were slotted into which half. But, maybe that's picking nits (and maybe it's not). Another concern I have is how varied the participants are. On one extreme we have a group of high-schoolers (Eleventh Hour, from Kettering, Ohio), and on another we have a group led by a veteran professional singer of 60-plus years (Jerry Lawson and Talk of the Town, led by a founding member of a cappella pioneers The Persuasions). And then there are the relative sizes of the groups, which range anywhere from just five members to well over a dozen, and that must certainly have an impact on the results. But then, maybe that's just the point: having the playing field so uneven makes it a competition for them all, and the smaller groups have to work hard to sound "bigger" just like the larger groups have to work hard to not overpower their sound. Bigger can be better, just as much as less is more, and determining the right song arrangement and approach to the performance is just as big a part of the competition. One of the biggest reasons I chose not to do a play-by-play commentary is because I can't help but admit that I'm biased as hell in favor of On The Rocks. I knew about and was watching and listening to these guys ten years ago, and they were just as much fun when they started out as they are now. They're talented, energetic, and one can clearly see how much fun they have doing what they do. Then again, that can be said for nearly all the groups we saw on Monday night's show. To be placed in the same class of performers as the venerable Whiffenpoofs is a big damn deal (their rendition of Mika's "Grace Kelly" was positively amazing, by the way! ), but it also means that On The Rocks has got some serious competition. The only possible drawback I can see is that they have a potentially unwieldy size of 15 members (which makes me wonder if the show shouldn't set a limit on the size of the group ... say, 10 or maybe 12). Will they make it all the way to the final round? I of course hope so, but I won't take anything for granted. After all, I thought Pitch Slapped (whose name I totally love!) was one of the better ones, but they somehow were given the boot. Personally, I think that The Backbeats (the collegiate "supergroup" from L.A.) and Groove For Thought (the jazzy Seattle group with the father-daughter duo) should have been the ones to go. But one thing's for sure: nearly every voice we heard on this show was more talented than 90% of the comparatively sorry crop of "American Idol" singers last season, which makes it all but inevitable that I won't be watching it ... unless my 2% doubt convinces me otherwise. Ten years before "Glee", co-creator Ryan Murphy started out in television with "Popular", an hour-long comedy-drama, also set in high-school and with a similarly larger-than-life style, that ran for two years on the WB network. 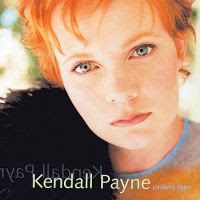 Chosen for the theme song to the series was the track "Supermodels" from Kendall Payne's debut album "Jordan's Sister". It was the perfect choice: a pointed commentary on body image versus self-worth, a struggle that the majority of teenagers go through at some point, and one of the ongoing themes of the entire series. I loved the show and its theme song so much, that I decided it was worth giving the album a try. For a debut album by a nineteen-year-old, "Jordan's Sister" is a remarkably mature work, and sees Kendall Payne following in the finest singer-songwriter tradition of her contemporaries like Paula Cole, Joan Osborne, and Sheryl Crow. Sure, she's got an assist from veteran, award-winning producer Ron Aniello, but listening to this album, one can easily get the impression that she probably didn't need his help. Just check out the tuneful, upbeat tracks "Hollywood", "Closer To Myself", and "It's Not The Time", or the beautiful, delicate ballads like "Honest", "On My Bones", and "Wonderland". The album may not be perfect -- her lyrics are often straightforward instead of subtle, and can therefore tend to seem out-of-place alongside such keenly composed melodies -- and her strong religious faith occasionally forces its way into the songs, and I much prefer my music to stay cleanly secular -- but the songs as a whole are catchy and enjoyable enough that I can look past these arguable shortcomings. This was Ms. Payne's only major-label release, but she's kept recording on independent labels since then, her fourth and most recent album appearing in 2009. I'm a ravenous devourer of aural delicacies, mundane and obscure, from far and wide. I live in the Pacific Northwest of the United States. This might be the most powerful nation in the world, but it's definitely got some of the suckiest music. Sleeve Notes: The World’s Worst Records!